Going Green or Hoarding Green? Organizations have the desire to reduce their impact on the environment but lack the will to pay a premium for cleaner operations, according to a cross-sector survey released recently by IT hosting solutions provider Rackspace. The report, called the Rackspace Green Survey (PDF), polled 3,000 of the vendor's customers to gauge their attitudes toward the environmental impact of their operations. The results did not come specifically from the education sector, but from a cross-section of Rackspace's customers. The survey was not broken down by industry, but the results are telling nonetheless. What it found was that while respondents expressed concern about their environmental impact, few were willing to smother those concerns with cash. And, in fact, the numbers willing to take a hit to their wallets or to their server performance in order to reduce their carbon footprints were actually lower this year than when the survey was first conducted in 2007. For instance, 48 percent of respondents indicated that they are "[c]oncerned and looking for ways to reduce the impact my company has on the environment" in 2008. That's up 12 points from the 2007 survey. But only 9 percent indicated that green vendors are central to their organizations' strategies, down 5 points from last year. Sixty-four percent indicated that green vendors are important (but not central) to their strategies, up five points from last year. Nevertheless, the will to pay for cleaner, more efficient technologies isn't there. While 71 percent indicated they would choose a green vendor over a non-green vendor if prices were the same (down four percentage points from last year), 46 percent said outright they would not be willing to pay a dime more for a green vendor. 2 percent said they'd pay up to a 50 percent premium (tied with 2007). Interestingly, 44 percent indicated they might be willing to pay a premium for green products or services if they could display some sort of green logo, and 25 percent aid they would definitely be willing to do so. But cash wasn't the only concern. 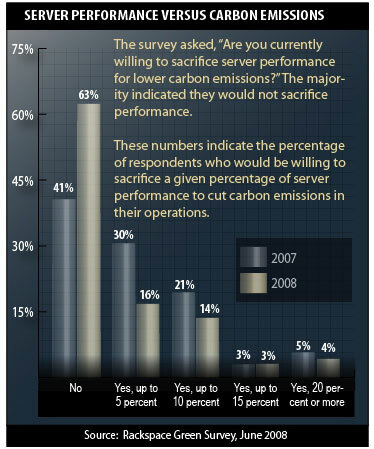 An overwhelming 63 percent indicated they would not be willing to sacrifice any server performance for lower carbon emissions--up 22 points from 2007. The chart below shows further results. Finally, when asked about how green their organizations currently are, respondents generally perceived themselves as being less green than they'd previously indicated. Fifty-two percent (versus 55 percent in 2007) said they've taken "first steps" toward going green. Seventeen percent (versus 21 percent in 2007) said they have taken significant steps, including educating employees, conserving energy, purchasing green products, and selecting green vendors. Sixteen percent (versus 23 percent in 2007) indicated they were "starting to think about it." Fourteen percent said flat-out that their organizations are not green and are not thinking about becoming green.